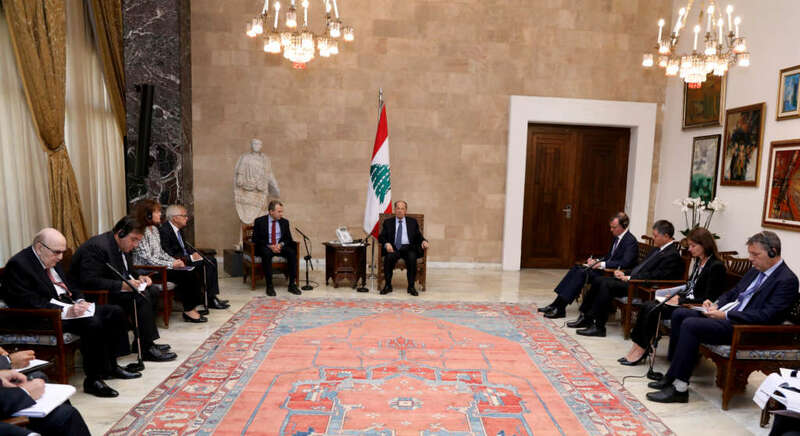 Beirut- Lebanese President Michel Aoun met on Monday with the ambassadors of the United Nations Security Council’s permanent members, in presence of the UN, EU and Arab League ambassadors, to discuss Lebanon’s stance on the file of Syrian refugees. Aoun sounded the alarm on the grave repercussions of the Syrian refugee crisis on the political, economic, and security levels, warning that this could affect the Lebanese workforce as the employment rate was on the rise. Foreign Affairs Minister Gebran Bassil also attended the meeting. Aoun handed the ambassadors letters to the Presidents of their respective countries, to the United Nations Secretary-General, and to the head of the European Union. “Providing appropriate conditions for the safe return of Syrian refugees to their country is a must, especially to the stable areas that can be reached, or areas of low tension,” Aoun said. Meanwhile, Prime Minister Saad al-Hariri’s advisor for the issue of the displaced, Nadim al-Munla, said that Aoun’s proposal to the Security Council’s ambassadors was likely based on the plan already submitted by Bassil to the government, stressing that the return of refugees has become a priority for the Lebanese prime minister. Munla noted that when Hariri returns from his official visit to Rome, he would call for a meeting of the relevant ministerial committee to discuss the return of refugees in light of the plans submitted by each of Bassil and Ministers Nohad al-Mashnouk and Moeen al-Merhebi.